Jerry York has been on the BC bench since 1994. 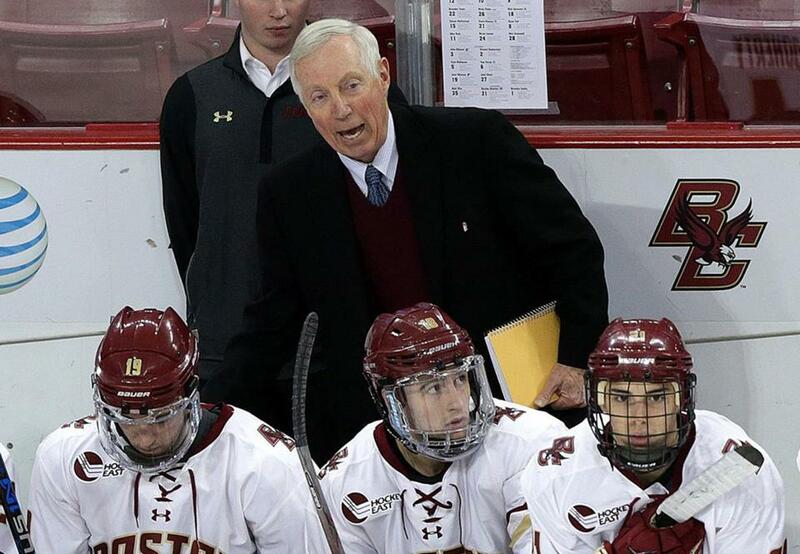 Hours before Boston College failed to keep Northeastern from repeating as Beanpot champions, the school announced that it had signed coach Jerry York to an extension through the 2021-22 season. York is college hockey’s all-time winningest coach with 1,063 victories, and is in his 25th season at BC. He has led the Eagles to at least a share of three straight Hockey East regular-season titles in addition to nine straight 20-win seasons. Both streaks are in jeopardy, however, with BC falling to 10-14-3 with its 4-2 loss to the Huskies in Monday’s Beanpot championship. The Eagles missed the NCAA Tournament the last two seasons and are likely to be on the outside again. BC hasn’t missed three straight national tournaments since York’s first three seasons, part of a six-year absence from 1991–97. BC has won four national championships under York, including three in a five-year stretch from 2008–2012. He has led the Eagles to 12 Frozen Fours and is the all-time leader in NCAA Tournament victories with 41. He collected his fourth Hockey East Coach of the Year award last season, going 18-6-0 in conference before losing in the tournament semifinals. Harvard defeated Boston University in the consolation game, 5-2, on a pair of goals from junior Frederic Gregoire and 24 saves from senior Michael Lackey. After a scoreless first period, Harvard scored twice in the second. Gregoire opened the scoring at 9:28, with the lead growing less than seven minutes later. Reilly Walsh went from left to right across the front of the net. Knocked to his knees, he found Jack Badini alone on the left, who one-timed it at 16:19. BU broke up the bid for a shutout on Patrick Curry’s 10th of the season at 6:11 of the third. Gregoire’s second, a nice wrist shot from the right that beat Vinnie Purpura (34 saves), put Harvard up 3-1 with 7:32 remaining and proved the game-winner. Empty-netters by Adam Fox and R.J. Murphy sandwiched a goal by Gabriel Chabot to account for the final. There was a crowd in front of Harvard goalie Michael Lackey during third-period action. With his empty-netter, Fox reached 100 points for his career. He became the first junior defenseman to reach 100 points since Wisconsin’s Justin Schults in 2011-12. He is the fourth defenseman in Harvard history to reach that plateau, joining Mark Fusco (1983, 135 points), Mark Benning (1987, 111), and Randy Taylor (1987, 102). The Terriers were again without senior captain Bobo Carpenter. The North Reading native has not played since Jan. 25 against Arizona State, when he became BU’s 83rd 100-point player. Northeastern coach Jim Madigan is one of three people in tournament history to win as a player, assistant, and head coach, joining BU’s Jack Parker and David Quinn. Monday marked Madigan’s 10th appearance in the Beanpot title game: three as a player (1983-85), two as an assistant coach (1987-88), and five as a head coach (2013-15, 2018-19) . . . All that was left for Madigan was to figure out where to celebrate. “We can’t go to Punter’s,” said Madigan, referring to Punter’s Pub, the watering hole on Huntington Avenue that closed down late last year. “I might have to re-open it though. I told them I’ll re-open it tonight.” . . . The Huskies moved to 6-13 in the final, winning back-to-back Beanpots for the second time (1984-85) . . . This marks the first time in 67 years of tournament history that neither BC nor BU has won a Beanpot championship in a stretch of three seasons. The Green Line rivals won 50 of the first 64 tournaments, and there has never been a championship meeting between Harvard and NU. Follow Andrew Mahoney on Twitter @GlobeMahoney.